Dental Medicine. He is a member of the American Dental Society, the Illinois State Dental Society, the Chicago Dental Society, and the McLean County Dental Society. 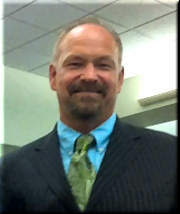 He celebrated his 25th year of practice in 2012. 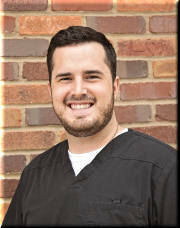 Dr. Burgess is known for his down-to-earth manner and good sense of humor. His patients have grown to appreciate his genuine sincerity and personal interest in their dental care and overall well-being. He and his wife live in Normal and have two daughters and a son. Their oldest daughter is an apprentice funeral director for Kibler-Brady-Ruestman while their other daughter is a 4th grade teacher in Heyworth. Their son attends Mizzou. They have two dachshunds and one cat. Dr. Burgess has served on the Boards of The Mulberry School in Normal (including a 3-year term as President), Unit 5 Citizens Advisory Council and the McLean County Childrens Protection Advocacy. Dr. Burgess and his family are members of Wesley United Methodist Church in Bloomington. Dr. Bardell grew up in Bloomington and graduated from Bloomington High School. In 2001-2002, Dr. Bardell served our country in Iraq with the Army National Guard. After her honorable discharge from the Army National Guard she received a bachelors of science degree at the University of Illinois in 2008 and a DMD from Southern Illinois University School of Dental Medicine in 2012. 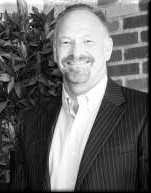 Dr. Bardell's husband, Miles, works for Prairie State Legal Services as an attorney. Miles and Dr. Bardell welcomed their first child, a girl, born in Feb. 2015. They have a goldendoodle, Stella, and spend a lot of their time playing with her at the many different parks in town. Dr. Bardell is delighted to give back to the Bloomington Normal community and looks forward to getting to know you and your family. We are excited to have her at our practice. Jody is the mother of three grown children. Her oldest son and his wife are proud parents of Jody's first granddaughter. They reside in Lexington. Her younger son is a brew master in the Seattle area. Jody's daughter--her youngest--is a hair stylist. Jody is very organized and strives to accommodate our patients by assisting with their financial arrangements and insurance needs. Jody and her husband live in Towanda. Colette begins each day teaching Pre-Kindergarten at Mulberry School in Normal. She has a Bachelors of Science degree in Early Childhood Education from Illinois State University. After school she brings her kind demeanor to our office to help coordinate the front desk operations. Colette and her husband, who were married in Dec. 2014, are St. Louis Cardinal and Green Bay Packer fans. Colette also is a season ticket holder for ISU men's basketball. Colette and Brian recently welcomed a puppy, Gidget, to their home; Gidget is a Bavarian Mountain Hound that is full of energy. Colette is appreciated for her infectious laugh and organizational skills. Diane ensures the smooth operation of our daily schedule. This busy mother of three and grandmother of two is an LPN who joined the medical field over 25 years ago. 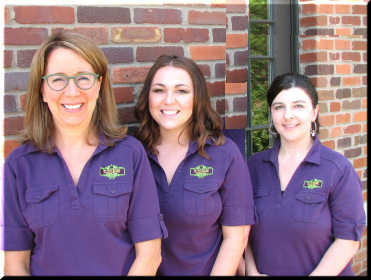 Diane efficiently coordinates dental care appointments to accommodate our patients' busy lifestyles. In return, our patients appreciate their appointments running on time. 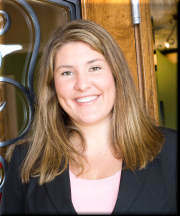 Erin joined our office as a dental assistant in 2005. She then went on to Lakeland College and became a registered dental hygienist. Erin, her husband and her son Bruer reside in Pontiac. They enjoy bike riding and spending time with their extended family. Erin has an eye for a bargain and enjoys frequenting antique auctions and flea markets. Everyone enjoys Erin's smiles and giggles. Becky has been keeping smiles bright since becoming an RDH in 1976. 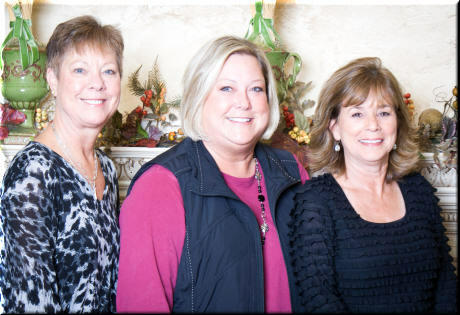 She and her husband, the golf course superintendent at Bloomington Country Club, have two grown children. Their son works for State Farm and lives in Bloomington. Her daughter, a nurse practitioner at the Community Cancer Center in Normal, and her husband are parents to two daughters -- Dani and Remi. Becky also enjoys her Australian Shepard, named Bunker. Melinda, who is from Pontiac, Illinois, has been an RDH in Bloomington since 1994. She is a graduate of Parkland College. Melinda is married to Tom, who is a partner with Dunbar, Breitweiser & Company. She has two daughters. Her youngest is currently in the CNA program and will be starting at Heartland Community College. They have 3 dogs and just welcomed a puppy, a English Pointer, named Zeus. Melinda has been a perfect fit in our office with her fun personality. Julie began her career in Effingham. After moving to Bloomington, she continued to provide quality care to her patients with Dr. Wieland until his retirement in 2001. Our patients enjoy her fun and caring personality as she often fills our halls with laughter. They have three grown children. Their oldest lives in Colorado, with her husband, and recently welcomed their first child, Maggie, in January. Julie is a proud Grandma to Maggie, 4 grand dogs and her own dachshund, Barney. Ellie brings an enthusiastic and vibrant spirit to our office. She is an Illinois Central College graduate. She lives in Normal with her husband, a Bloomington police officer. They are the proud parents of Brody and Levi. Patients appreciate her thoughtful interest in their care and life. Luke is from Bourbonnais, Illinois. He went to Hygiene School at Parkland College and is currrently enrolled at ISU to obtain his bachelors degree in biology. Luke enjoys cooking, tennis, fishing and hockey. Luke has been a great addition to our staff. Julie K grew up in Eureka, Illinois, and is an Illinois Central College graduate. She has been a Registered Dental Hygienist for 15 years. She now resides in Congerville with her husband, Ben, daughter Camryn, and son Cooper. Julie enjoys camping, kayaking, bike riding, running with the Eureka St. Jude Team, and Cubs baseball. Her fun and spunky personality has been a great fit to our office. 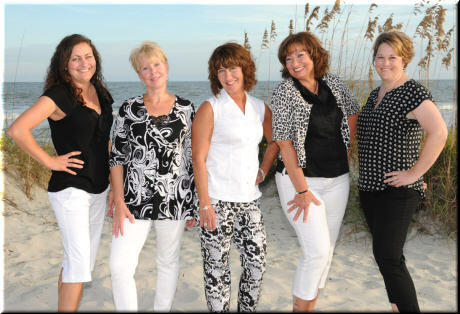 Kathy is a dental assistant who joined our office in 2011. She and her husband Jed, who works at ISU, have three children. Their oldest son is a freelance videographer, the youngest son attends ISU and their daughter is a student at U-High. The family enjoys spending time with Ellie, a rescue dog they welcomed to their family in February, 2015. Patients often comment on how welcoming and comforting Kathy is. We welcome the newest member of our assisting team, Kali. Our patients appreciate her sweet & genuine nature. Kali and her husband, Zac, have a son Kai who was born in 2014. They enjoy fishing and are Chicago Blackhawks fan. We are pleased to have Cathy return to our assisting staff. She brings with her 34 years of assisting experience. Patients appreciate her sweet and kind persona. Cathy enjoys cooking, music concerts and volunteering in the community. She is originally from Farmer City and has a daughter who lives in Bloomington. 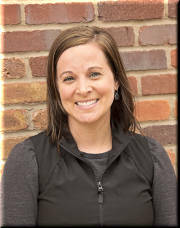 Anna has been a dental assistant for over 10 years. Originally from Poland, she currently resides in Colfax, Illinois. Anna is not only busy assisting Dr. Burgess at our office, she is a licensed cosmetologist. In addition to turkey hunting, Anna enjoys spending time with her husband, Mike, and their children, Brynlee and William. Anna is appreciated for making her patients feel at ease while in our office. 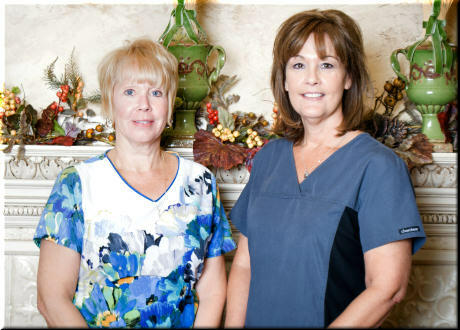 While all of our Staff are happy to answer any of your questions about our whitening systems,Becky & Cathy T are our ZOOM! specialists: ZOOM! info.